Ken Moody has been in tax for over 30 years and has experience over a wide range of direct tax issues. After a brief spell with HM Revenue and Customs he qualified as a Chartered Tax Adviser with a local Sheffield firm of Chartered Accountants. He subsequently joined a top 30 independent firm of Chartered Accountants in London where he managed the corporation tax affairs of a household name quoted group, before moving to a similar role with Saffery Champness. Returning to his northern roots, Ken has, for the last 15 years mainly specialised in the tax affairs of owner-managed businesses, during which time he has written numerous articles for professional journals and other published material. 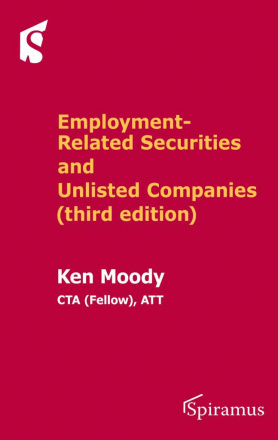 He has been closely associated with the ERS rules since the current legislation was introduced in 2003 and has written articles for Taxation magazine and produced other guides on the topic which he has now developed into the current work. Ken is an independent tax consultant.